Admit it, you are rolling your eyes at the title of this blog entry. But that is because you haven’t tried this recipe. Yet. 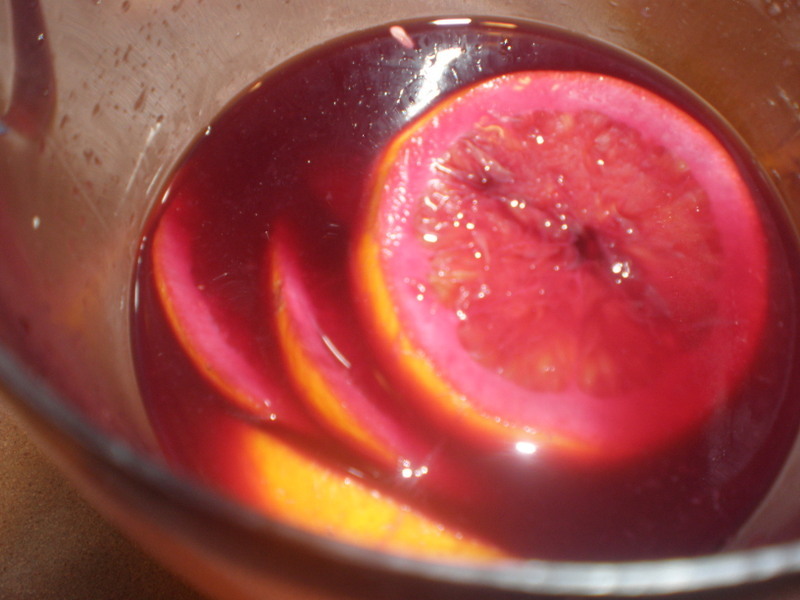 Sangria comes from the Spanish word sangre which means blood, perhaps referring to the glorious color and warming qualities of this refreshing drink. I’ve heard it said that sangria is meant to be a warm weather drink (it originates in the temperate climate of Spain), but I beg to differ. 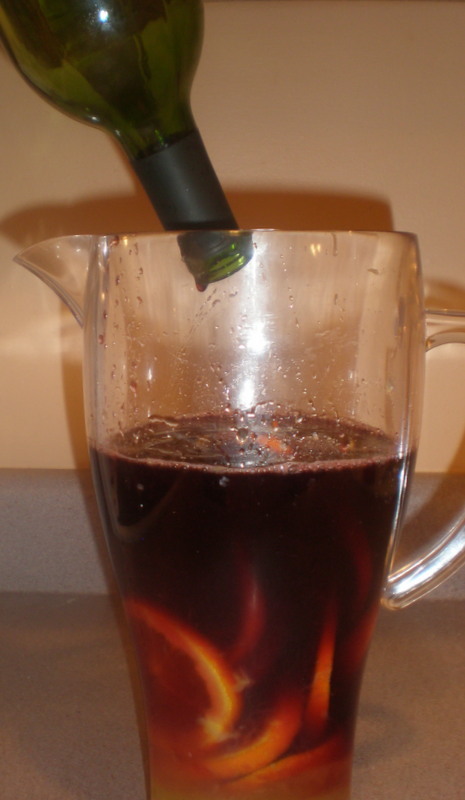 It turns out that December 20th is National Sangria Day, right around the time I became obsessed. Coincidence? I think not. There is nothing more lovely to drink when the winter weather is bleak than luscious dark red wine infused with magenta stained fruit. 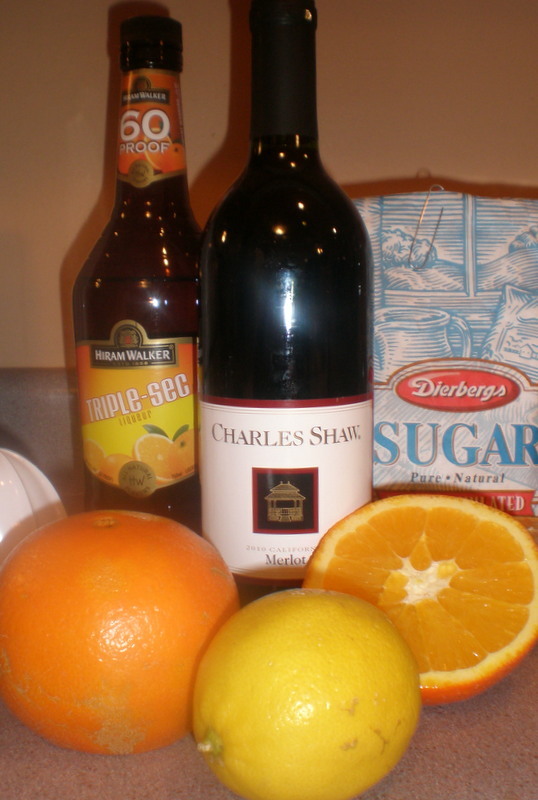 You will find it a wonder that an inexpensive wine can be transformed by a few simple ingredients: Triple Sec, sugar, oranges and a lemon. 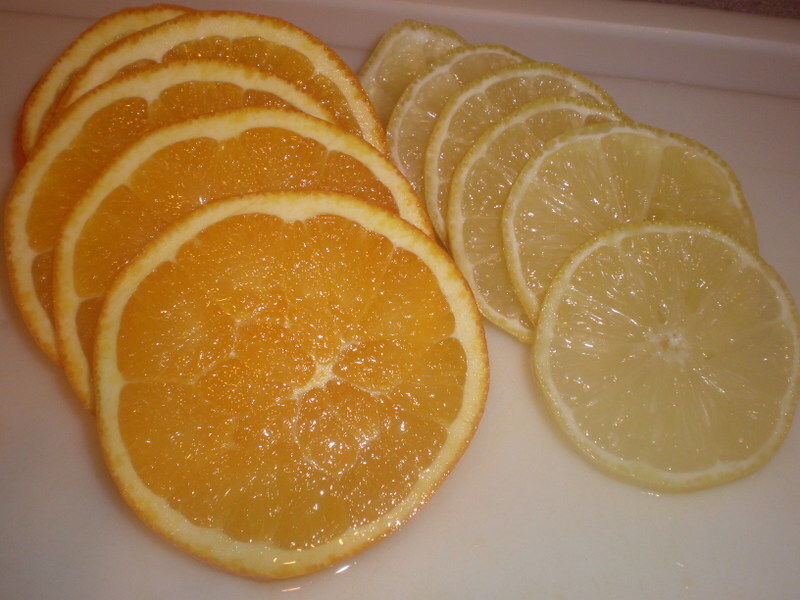 Plus citrus is in season right now, which is the best way to eat, er, I mean drink. Usually I am the type of light drinker who thinks a bottle of wine serves 6 people (see, no worries mom), but this recipe, which uses a whole bottle of wine, seems to be perfect for 4 to each have a glass (maybe even while catching up on episodes of True Blood–just sayin’). 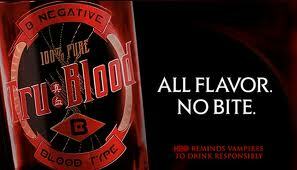 And I really enjoy wine but this goes down even easier with its sweet fruity flavor and robust taste. You should make it in the morning–It takes a whole day of sitting to mellow and let the flavors blend, but it is worth waiting for. You might find yourself opening the fridge mid-morning to grab some milk for your coffee and will wonder if you shouldn’t have a nice refreshing glass right then (you shouldn’t). Instead, it will make the whole day more bearable knowing what is waiting for you at the end. So plan ahead to raise a glass or two with a friend and enjoy. The first thing you need to know is that you don’t need to buy anything fancy at the wine store. Spend under $10 for a fruity Merlot and you’ll know you have the right one. I used Trader Joe’s Coastal Merlot ($4.99) and was very pleased with the results. 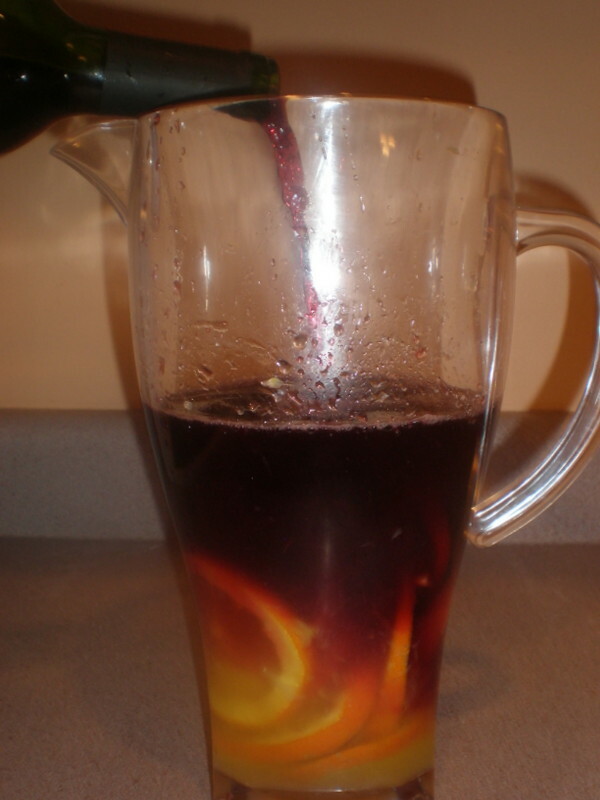 Next, get a pitcher, preferably with a rounded bottom for easy stirring, and if you are going to double or triple the recipe get a very large pitcher or even a punch bowl to make this in. Last, you will be tempted to throw in other fruit, perhaps at someone else’s recommendation (like the checkout person at the supermarket), but try to refrain from altering perfection. Although at the end, feel free to add a splash of sparkling water if you want something fizzy and festive. 1. 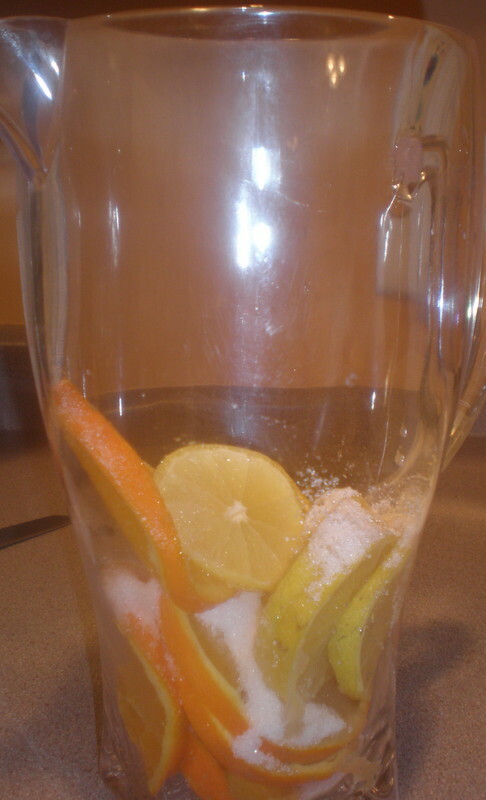 Add sliced orange, lemon, and sugar to large pitcher; mash and stir gently for about 1 minute, using a wooden spoon until fruit releases some juice (but is not totally crushed) and sugar dissolves. 2. Stir in orange juice, triple sec, and wine; refrigerate for at least 2 hours (but seriously try to wait longer) and up to 8 hours (for perfection). 3. Before serving, add 6 to 8 iced cubes and stir briskly to redistribute settled fruit and pulp; serve immediately. 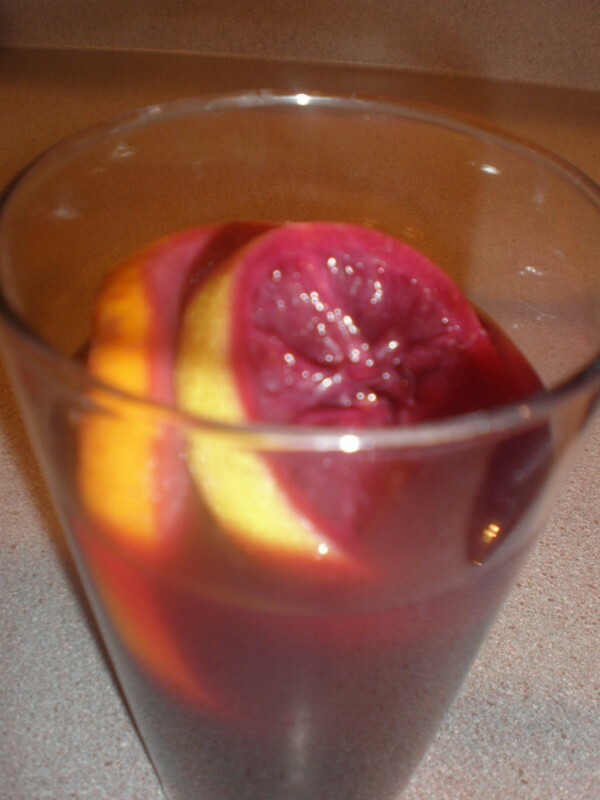 This entry was posted in Beverages and tagged America's Test Kitchen, Citrus, Merlot, National Sangria Day, Sangria, Trader Joe's, True Blood, Wine by pomegranatesandhoney. Bookmark the permalink. I'll try to keep it up! LOL! I made this again the other night and I added a splash of sparkling water to each glass and that was good too! 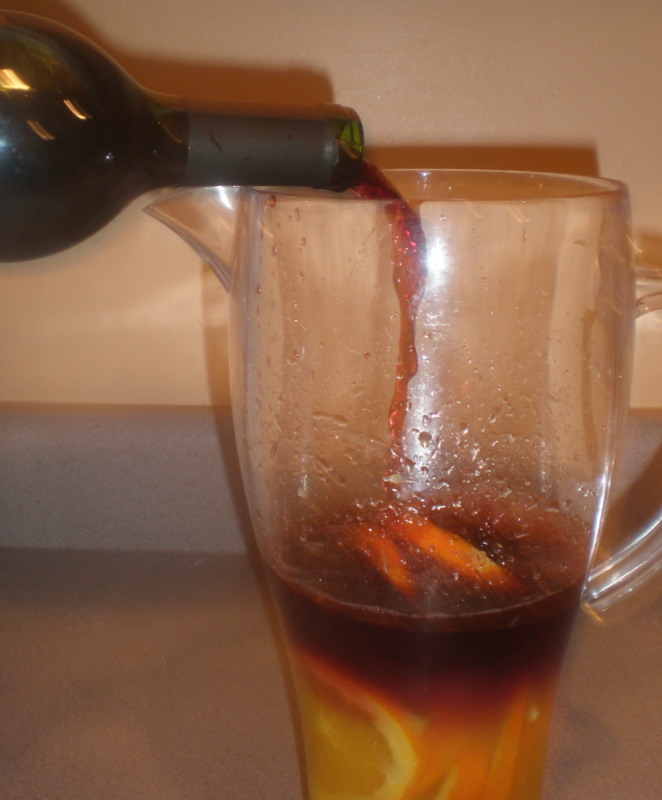 Wow I was JUST saying that its about time I figured out how to make sangria. You did that to me with latkes too. I like that you read my mind once a month, its really quite time efficient!